Doctors of Chiropractic regularly treat Sciatica. Sciatica is characterized by pain that originates in the low back or buttock that travels into one or both legs. Sciatic nerve pain varies in intensity and frequency. 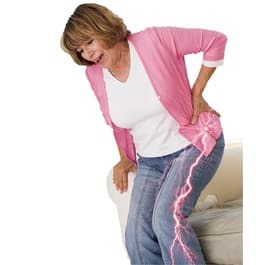 Pain is described as dull, achy, sharp, toothache-like, pins and needles or similar to electric shocks. Other symptoms associated with sciatica include burning, numbness and tingling sensations. Sciatica is also called radiating or referred pain, neuropathy, or neuralgia. A misconception is that sciatica is a disorder—however, sciatica is really a symptom of a disorder. It is important to correct the root cause of the condition as soon as possible before it becomes chronic or leads to other nerve deficits. Sciatica is generally caused by nerve compression in the low back. Disorders known to cause sciatic nerve pain include lumbar spine subluxations (misaligned vertebrae), herniated or bulging discs (slipped discs), pregnancy and childbirth, and non-spinal disorders. Sciatic nerve compression may result in the loss of feeling (sensory loss), loss of bowel and bladder function, and loss of strength (motor deficit). Since there are many disorders that cause sciatica, the chiropractor’s first step is to determine what is causing the patient’s sciatica. Forming a diagnosis involves a thoughtful review the patient’s medical history, and a physical and neurological examination. Diagnostic testing may include an x-ray, MRI, CT scan and/or electrodiagnostic tests (nerve conduction velocity, electromyography). These examinations and tests help to determine the most appropirate treatment plan. The purpose of chiropractic treatment is to help the body’s potential to heal itself. It is based on the scientific principle that restricted spinal movement leads to pain and reduced function and performance. Chiropractic care is non-invasive (non-surgical) and drug-free. The type of chiropractic therapy provided depends on the cause of the patient’s sciatica. Adjustments (Spinal Manipulation) At the core of chiropractic care are spinal adjustments. Adjustments free restricted movement of the spine and helps to restore misaligned vertebral bodies to their proper position in the spinal column. Spinal adjustment helps to reduce nerve irritability responsible for causing inflammation, muscle spasm, pain, and other symptoms related to sciatica. Although treatment equipment and technique can vary per case, spinal adjustments are not painful and have been proven safe and effective. For Sciatica patients we typically utilize very conservative non forceful treatments such as disc distraction, drop technique and others. Most importantly Chiropractic treatment is designed to get to the root cause of the Sciatica versus masking the symptom with medication. Many sufferers of sciatica have experienced dramatic relief of their pain after Chiropractic care. In most cases resolution is relatively quick in a care plan. In 2007, a study was conducted on 44 workers hospitalized with sciatic pain in Norway. Each were adjusted by the hospital chiropractor and 91% returned to full-time work within an average of 21.1 days – a reduction on the average 72 days it takes for sciatica patients to return to work. During your visit to our office, the doctor of chiropractic will perform a detailed consultation and examination to locate the source of your pain. This will involve a series of questions about your current condition, followed by physical and neurological exams. In the physical exam, your doctor will observe your posture, range of motion, and physical condition, noting movement that causes pain. The doctor will feel your spine, note its curvature and alignment, and feel for muscle spasm. A check of your lower extremities may also be in order. During the neurological exam, the doctor may test your reflexes, muscle strength and sensory testing. If warranted, the Doctor may take x-rays and/or computerized muscle tests. Once all of the information is collected to develop a specific diagnosis, a report of findings will be delivered to you. The report of findings will discuss what is wrong, is it treatable and how long will it take to resolve. If you qualify for conservative chiropractic care, recommendations for the appropriate adjustments and therapies will be provided and treatment will begin that day.